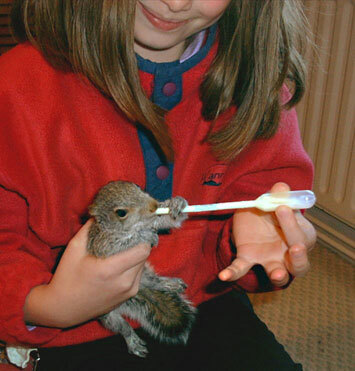 Assuming that your baby squirrel is warm and not dehydrated, it will need feeding as soon as possible. Basically, the younger the squirrel, the less time it can survive without milk. Tiny babies less than 2 weeks old (pinkies) are especially vulnerable. The baby will need feeding with substitute milk, (see recipe at end of this section) regularly throughout the day, using a pipette, or a syringe with the needle removed. Allow the baby to determine the speed of the feeding. Initially, the baby may take a few minutes to get used to feeding this way. Gently offer a drop by perhaps lifting the baby’s lip and putting a drop in the mouth. Be careful to allow baby to swallow at its own speed, as it is easy to feed too quickly and milk can enter the lungs, which can prove fatal. We advise feeding every 2 hours from dawn to dusk, although once the babies reach 5-6 weeks, every 3 to 4 hours will suffice. Keep the intervals regular as they will expect food. The amount a baby squirrel takes is dependent upon its age, and amounts may vary slightly each time. A tiny baby may only need a teaspoonful or two at each feed, whereas as they grow babies can get through several teaspoonfuls each time, until their bellies get very pronounced! Feed them slowly and let them dictate the amount. They will stop once they are full. Occasionally the baby squirrel may take only a very small amount. This is not a problem as long as it takes plenty next time. Any squirrel under 8 weeks of age will be totally reliant on milk. Generally, squirrels up to 12 weeks old will still appreciate some milk. 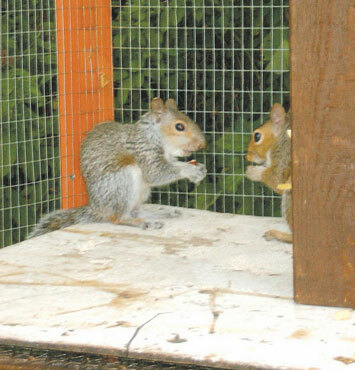 Between 8 and 12 weeks the juvenile squirrel will start to be weaned and need a variety of food in addition to the milk. Young squirrels that have been weaned (or mostly) will appreciate water (preferably filtered) that has the chill taken off it. At first use a small pipette, and later attach a feeding bottle (such a you would use for a hamster) to the cage. Don’t force it on the squirrel - be gentle and patient and the squirrel will usually get the idea! Small pieces of nuts (especially pine nuts which are quite soft) preferably mixed, with not too many peanuts. Obviously the nuts must not be in their shells and must be unsalted. Small pieces of fresh fruit, such as apple, grape and banana, as well as broccoli and carrot. Dried fruit such as raisins and sultanas. Special K - especially with red berries! Small pieces of digestive biscuit. Offer a small amount as there will be wastage. It is trial and error as what one squirrel will devour, another will toilet on! Juvenile squirrels will begin to appreciate nuts in their shells, but they may need you to partially crack them open until their teeth are stronger or before they get the hang of cracking shells. Variety is certainly the spice of life as far as a squirrel’s diet goes. • Use two thirds goat’s milk and one third cow’s milk, preferably organic and full cream. Semi skimmed is temporarily acceptable but skimmed has no benefit to the squirrel. Remember you are trying to replace mother’s milk. • Also use live yoghurt, from cow’s or sheep’s milk, as the baby’s stomach will need the friendly bacteria. • A drop of Abidec (or similar) – toddlers’ liquid vitamins available from a chemist or superstore. This is not essential, but advisable. To ¼ pint of milk add 1/2 teaspoon of live yoghurt. Add one drop of Abidec if available. Stir well! The milk should be lukewarm when fed to the baby squirrel. Pour just a small amount (a few teapoonfuls) into a small container and store the rest. For hygiene, discard any milk left over in the small container after each feed. To store, cover and put it in the fridge. Only keep a batch for 24 hours. Remember that the milk must be lukewarm before feeding, so just warm up a small amount at each feed. Pour a few teaspoonfuls into a small cup or glass and warm in a bowl of hot water. The recipe above is tried and tested by us to a good degree of success, but nature has taught us to be flexible. We had one baby whose siblings thrived on scalded cow’s milk, but it made him weak. We tried him on scalded goat’s milk and he perked up. In the wild, adult squirrels will eat a varied diet, which may include nuts, acorns, bark, shoots and leaves, seeds, roots, bulbs, cereals and fruit. Squirrels in our care also appreciate variety and we offer a mixture of nuts (some shelled, some unshelled) such as walnuts, pecans, hazels, brazils, almonds, cashews and pistachios. They will eat peanuts, but we don’t feed these predominantly as they are of limited nutritional value to squirrels. Other foods we add may include broccoli, carrots, apples, grapes, dried fruit and the occasional piece of banana, lettuce or cauliflower or seeds such as sunflower. Squirrels are broadly considered vegetarian, and are not fussy eaters. Like people, though, their preferences may vary. If you want to feed squirrels in your garden offer a mixture of the above foods and see what they enjoy!